Shrimps Abatha coat – £595This season’s update of Shrimps’ iconic coat, I love the subtle forest green shade of this coat, perked up with a bubble gum pink trim on the collar and cuffs. Shrimps rainbow clutch – £195I have a slightly different clutch in bright orange and blue and I absolutely love it. It adds a playful edge to my outfits and will be GREAT for the party season. 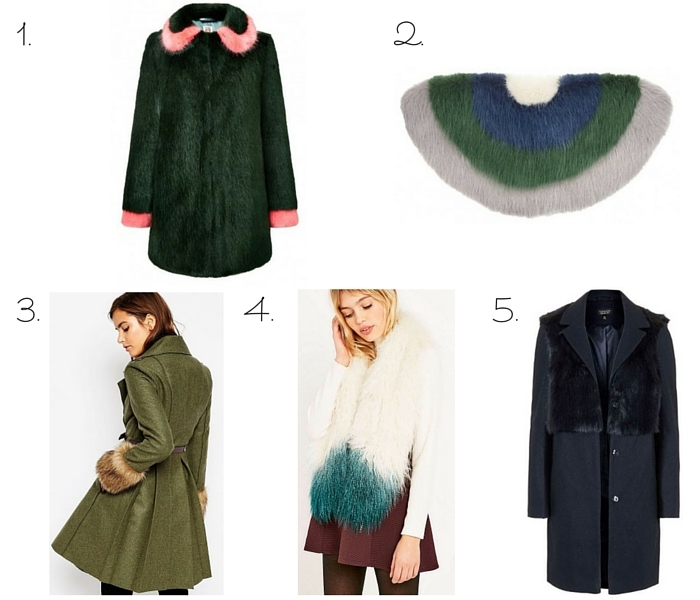 ASOS coat with faux fur cuffs – £110I know faux fur isn’t for everyone, but who can resist this beautiful moss green coat with faux fur cuffs for a subtle addition of fur? Urban Outfitters Mongolian faux fur scarf – £39Another subtle take on faux fur, this Mongolian fur scarf looks so cosy! I love the pretty winter white colour and splash of teal. Topshop faux fur hybrid coat – £89Masculine tailoring and faux fur aren’t the most obvious combination but, as this coat shows, they really work together.